My love for cheese and entertaining people at home has been well-documented here (especially the cheesy part). Understandably, I consider putting together the perfect fall cheese platter essential (and so much fun!) for a relaxed lunch or dinner at home. I love cheese. All kinds, all textures, all smells. What I love even more, is sharing it with others. Well, that’s not entirely true. I’m up for sharing if there’s enough cheese available. Let me give an example: one of the biggest fights I’ve ever had with Mike was because of a big chunk of cheese; I’d chosen it carefully and was keeping in the fridge, guarding it like a dragon; one day I came back from work late to discover that most of my precious had been hacked away and consumed by him and one of his friends. Not quite a deal breaker, but close. So, to recap, sharing cheese I love, as long as there’s plenty of it, purposely purchased for sharing. 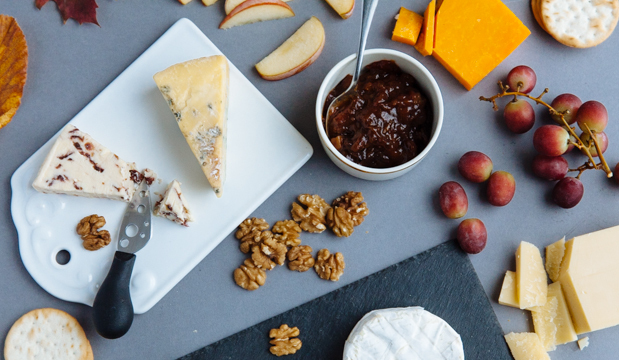 Most of our entertaining begins with (or sometimes are limited to) a beautifully put together cheese platter. When I’m not visiting one of my favourite cheese mongers, my go-to place is Waitrose, as it stocks an excellent selection of cheeses from various regions in different price ranges. 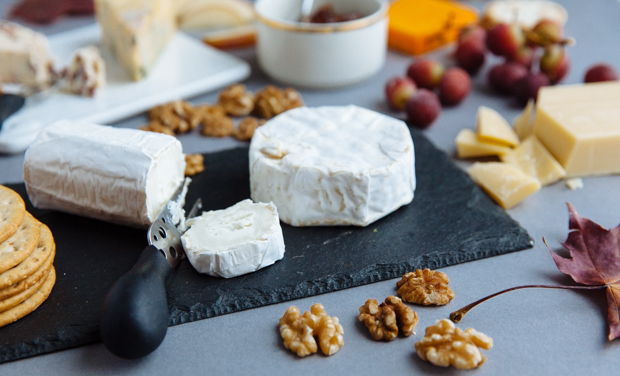 A few different varieties will suffice and throwing in a couple extra trimmings will not only make your perfect fall cheese platter shine, but also bring the favour of each cheese forward. When choosing what to include, think of different textures and flavours: hard, soft, creamy, salty, sweet, strong-flavoured and perhaps one with some add-ins (such as peppercorns or fruit). You can also go with cheeses made of different milk (cow, goat and sheep), or just go with crowd-pleasers like I did, and select mostly cow milk varieties. A gruyère, hard and perfectly balanced between salty and sweet; a creamy brie and a punchy Stilton; a crumbly cranberry Wensleydale, a mild Red Leicester and finally a small log of velvety goat’s cheese. You don’t need huge pieces, cheese is usually quite filling and strong in taste, so dispaly enough from each for your guests to have a good taste of. 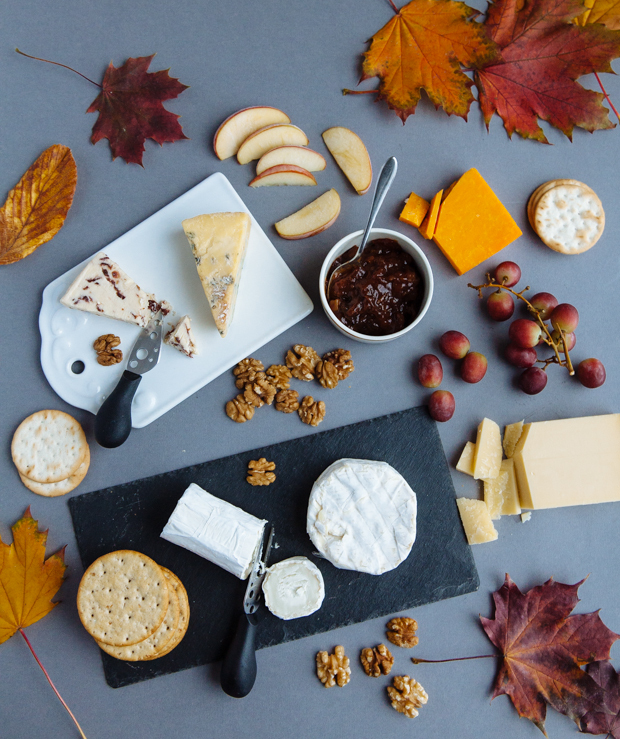 What you do need though are some bits and bobs to pair your cheese with and enrich your fall platter. Very good quality honey, fig jam or a fruity and spicy chutney are very good choices (or if you’re feeling adventurous, pieces of this delicious quince paste). You may also want to add nuts (like pecans or marcona almonds) and fruit (fresh or dry) which also pair very well with cheese. Lastly, you’ll need something to help you carry the cheese from the platter to your mouth: simple good quality crackers without any flavouring, or thinly sliced rye bread make excellent choices (as do your fingers- I have to admit I use those very frequently). 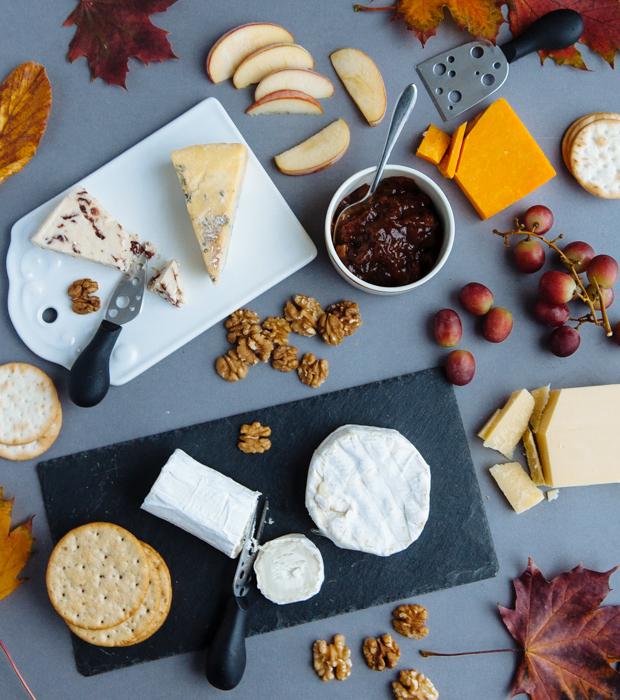 I’d love to hear what’s in your perfect fall cheese platter!